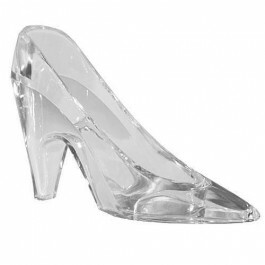 Turn your fairy-tale celebration into a dream come true with our Cinderella Slipper Centerpiece. Transparent plastic, high-heeled "Glass Slipper" will turn any celebration into a magical affair. An excellent choice for a castle, fairy-tale or Cinderella-themed party, engagement, wedding, shower. Use them at the party to hold flowers, candies, nuts, salt & pepper, sugar packets, or sugar cubes... the list is endless. Place a few in the center of the table, perhaps creating a circle of them, or at each place setting. 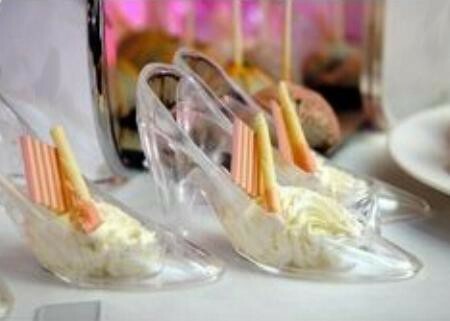 We love the idea of using the slippers for your desserts. They can even be used as a holder for eye glasses or cell phones. Place in the middle of each guest table as a small, sparkling centerpiece, and then give them as prizes or take home gifts for jewelry, paper clips, stamps, etc. 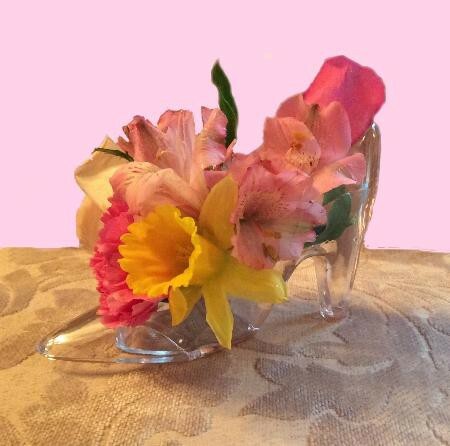 The "perfect fit" with our petite Cinderella Slipper Fillable Favor. Sold in sets of six. Dimensions: 5 1/2"l x 1 1/2"w x 3 3/4"h.
These "centerpiece" are very adorable and affordable. It is my own fault that I didn't pay enough attention to the size of them. They are hardly a centerpiece and can be with very little candy, but definitely not a centerpiece on its own. I was hoping for something larger. I will make it work though into another centerpiece idea I have because they are that cute. Just keep in mind of the size before purchasing. The picture is deceiving.. Thanks for the beautiful shoes. They were better than i expected. Looking forward to using them at the wedding. These shoes were a pleasant surprise. They were very cute and went with the theme of shoes and purses for the bridal shower. They were not as big as I would have wanted buy I knew the size and was hoping they worked, which they did. Made great door prizes. Wish I has ordered more everyone loves them.